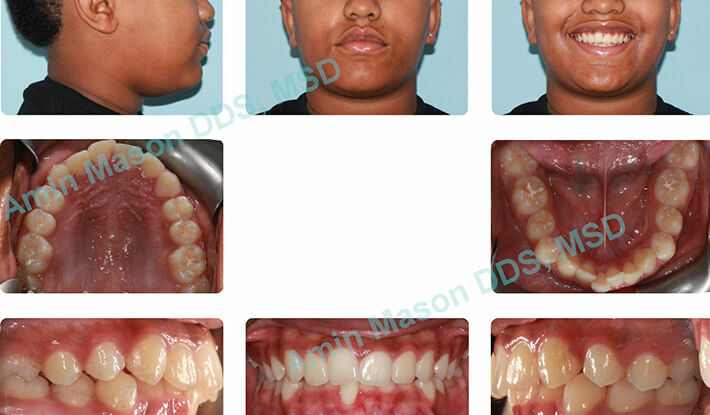 Accelerated Osteogenic Orthodontics (AOO) formerly known as Wilckodontics is a treatment modality that reduces the time needed to move teeth into a desired position by increasing the rate of bone turn over by initiation of regional acceleratory phenomenon. This treatment allows for the reduction of the time-frame that a patient undergoes orthodontic treatment up to 2-3 times. We specially recommend this procedure for patients that do not have enough bony support for orthodontic tooth movement and/or have reduced gingival attachment. Addition of bony support during this procedure allows the orthodontist to safely move crowded teeth without removing permanent teeth in most cases. 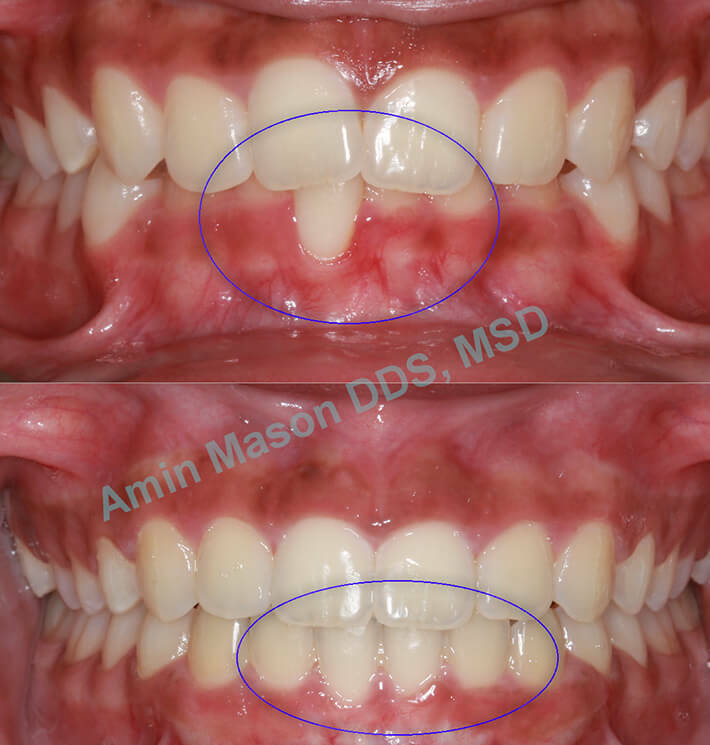 The increased in rate of tooth movement is a good side effect of this procedure. 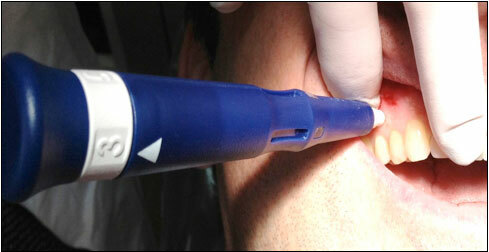 Only specially trained periodontists are able to perform this relatively new technique. The orthodontist coordinates the timing for the procedure with a periodontist before start of the orthodontic treatment. 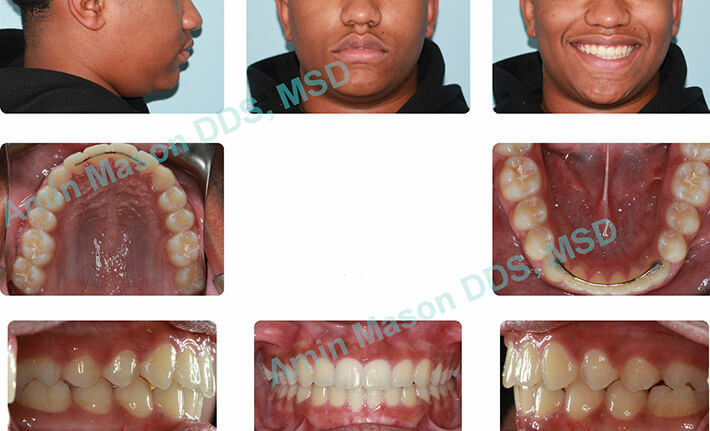 Patient presented with deep bite, severe gingival recession on lower incisor tooth, AOO procedure was performed and bone was augmented on the lower front teeth during orthodontic treatment. 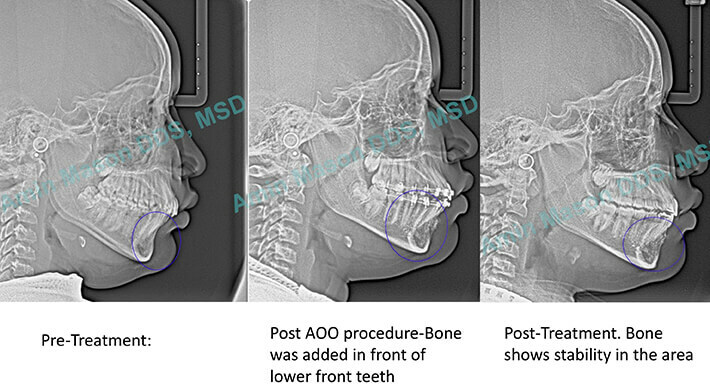 Radiographs and pictures show stability of the bone and improvement of the recession post treatment. AcceleDent® Aura and Propel VPRO5 are vibration devices that are utilized to send micro vibrations to your teeth during orthodontic treatment. 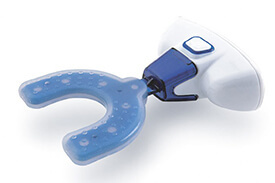 AcceleDent® Aura and Propel VPRO5 are simple-to-use, hands-free devices and require scheduled daily use. 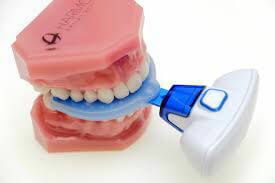 Both devices generate small vibrations or micropulses that cause vibration of the teeth. These micropulses may help accelerate the remodeling of the bone surrounding your teeth to speed up tooth movement. 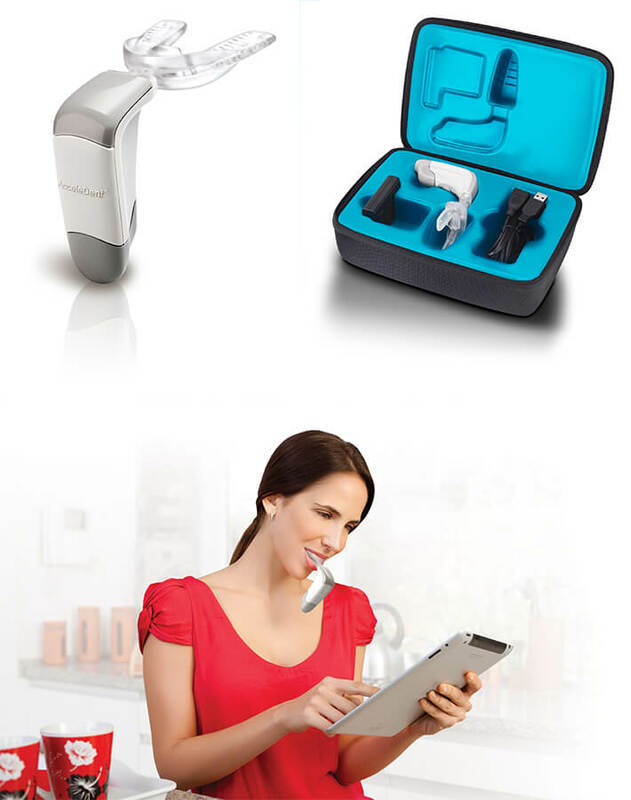 Both of these devices are fairly new to the market and are undergoing further clinical research for evaluation of their effectiveness. We have had patients report reduction in pain associated with tooth movement and have seen reduction in treatment times in some patients. PROPEL is an innovative, in-office procedure that can be used during your orthodontic treatment to reduce treatment time or help accelerate difficult tooth movements. During this procedure, small holes are created in the patient’s bone using a driver. Creation of holes helps stimulate the remodeling of bone which can expedite tooth movement and help with difficult orthodontic movements. The procedure takes about 5-10 minutes and requires small local anesthetic injections.